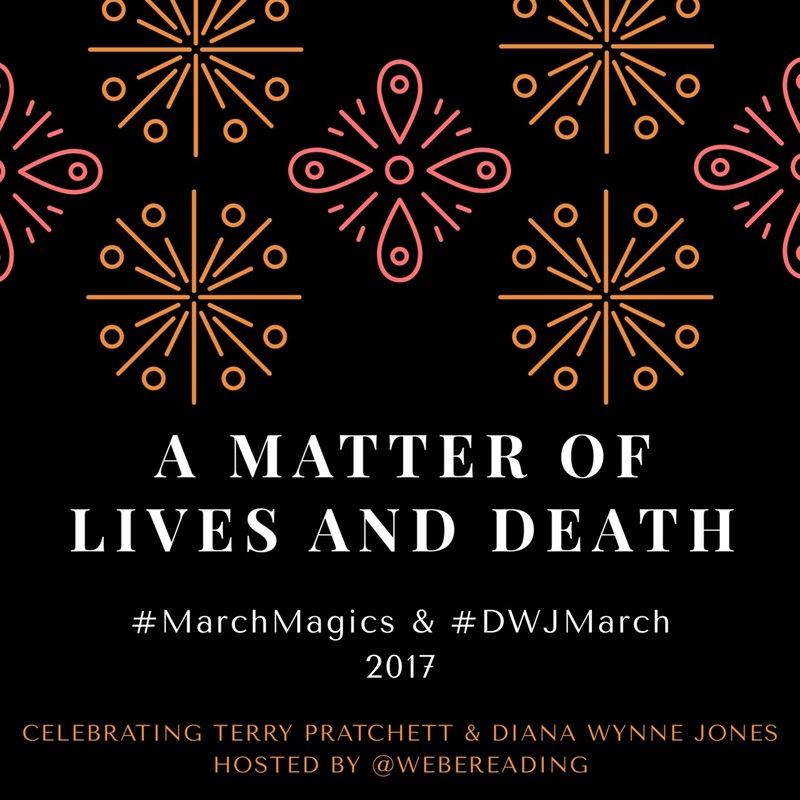 We Be Reading: #MarchMagics / #DWJMarch : Launch! 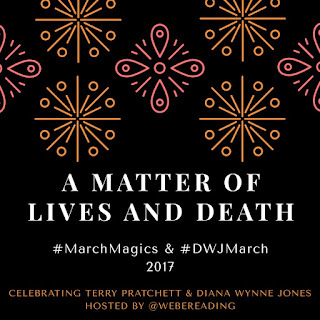 #MarchMagics / #DWJMarch : Launch! Happy March! 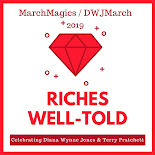 The time is here to do some glorious reading and rereading of the books of our beloved Diana Wynne Jones and Terry Pratchett. Hooray! As always, everyone is welcome to read as much or as little from one or both of these authors as they desire. I'll be posting about the Chrestomanci and Death series on this schedule. (The first book is Charmed Life, discussion up on the 3rd.) Feel free to stop by any of those posts and leave your thoughts. If you post about any other books, be sure and leave me your links (here or on Twitter) and I'll spread the word. You can use either hashtag on Twitter and I'll be retweeting everything. Use the hashtags on Instagram too! If you aren't sure what to read this month, we have a stellar guest post by Lory tomorrow that might give you some ideas. You can also ask Jenny on Twitter for a personalized DWJ recommendation and I'm sure she'll be more than happy to oblige. And, finally, here is a little info on each of the two series that I'll be reading, in case you aren't familiar with them. Now, if someone did not control all these busy magic-users, ordinary people would have a horrible time and probably end up as slaves. So the government appoints the very strongest enchanter there is to make sure no one misuses magic. this enchanter has nine lives and is known as "the Chrestomanci". You pronounce it KREST-OH-MAN-SEE. He has to have a strong personality as well as strong magic. Readers get to meet a couple of different Chrestomancis over the course of six books (and four short stories in Mixed Magics). The one you will come to know best is well-known for his fancy dressing gowns and amazing wife. The four stories we will be reading skip around in time but tie together. Death is, well, The Grim Reaper. He has black robes and a scythe, a beautiful Victorian house and garden, and a slowly-expending hourglass for every person alive. He also has an adopted daughter and a granddaughter and, strangely, he's a bit lovable. He "speaks" in small caps straight into the minds of those who are unlucky enough to meet him. Death apparently appears in all but two of the Discworld books but I'll be sticking to four of the five books that are considered the Death series and feature him or his family as main characters. So, I think that's enough to get us going. If you know what you are planning on reading this month, share it in the comments! I am hoping to join in a bit. We will see how that goes! It's definitely difficult to commit to things right now. I hope you find time for at least one read though! Yay! I'm so glad you're joining in again!